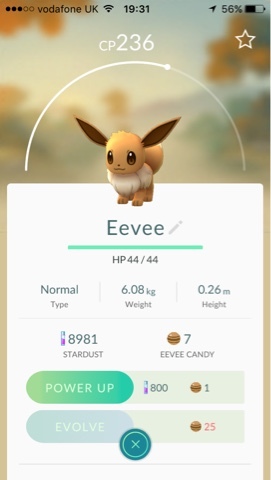 Just a quick post from me today where I will take a look at Eevee and controlling its evolution. Jolteon, Vaporeon and Flareon all evolve from the same base Pokemon, Eevee, but what if you want a specific one of these three when you evolve Eevee? Fear not you don't have to leave it to chance! Niantic have paid homage, once again, to the original pokemon series by harking back to The Battling Eevee brothers. For those of you unaware of who these are there were 4 brothers who specialised in training Eevees. Mikey, the youngest, had your base Eevee. But sorry Mikey you aren't involved in today's discussions. His three older brothers, Sparky, Rainer and Pyro, have the three evolutions of Eevee. This is important because if you want a particular evolution all you need to do is name your Eevee after the brother who used that particular evolution. Pyro will evolve into Flareon, rumoured to be the evolution with the strongest attack characteristics. Rainer will become Vaporeon, who appears to be the most popular evolution in my local area. 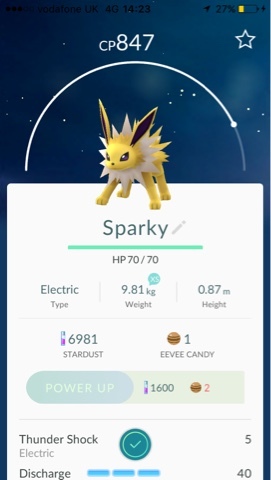 And last, but not least, is Sparky who will evolve into a Jolteon. This is the evolution I chose for my first Eevee to counter all the water Pokemon in my area, and here's the proof that it works. Of course you don't just have to take my word for it. Check out Niantic at the San Diego Comic Con where they confirmed it themselves! So there you have it, your desired Eeveelution is just waiting for you to put the right nickname into the game. Don't worry, you can always change back to that funny nickname after you have evolved your Pokemon.